While the Brits were hatting it up at Ascot, Luxembourg's grand ducal family did the same for National Day. They even one upped them a bit by donning their best chapeaux and a selection of family tiaras. It was, however, a sadly small group this year; while most (if not all) of the Grand Duke and Grand Duchess' five kids usually join their parents for the event, this year they were joined only by the Hereditary Grand Duke and Hereditary Grand Duchess. Princess Stéphanie surely did her best to give us all the sartorial interest we were missing out on with a smaller family group. It was a valiant effort, primarily involving a hot pink cape dress which I probably should love, given my usual cape weakness. And perhaps I would love it, if it were just a teensy bit less...craft project-y. Hmmmmmm. I preferred Stéphanie's offering from earlier in the day, an orange Paule Ka dress paired with some fun Rupert Sanderson shoes. 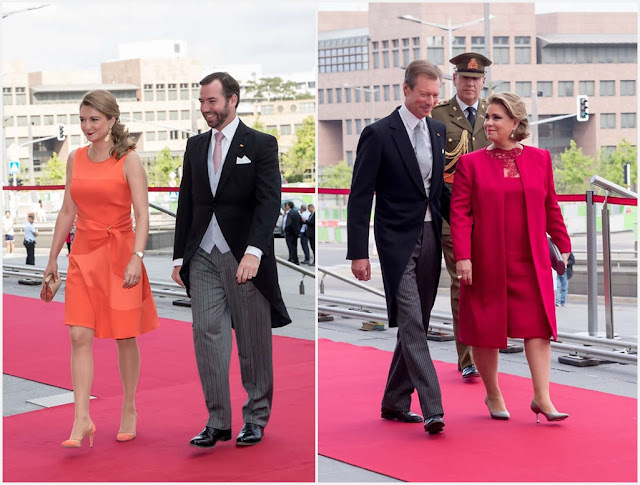 Grand Duchess Maria Teresa did not opt for an outfit change between day events, simply adding a matching hat to her red Yves Dooms coat and dress. I can't blame her. That's classic as classic can be, and she looks absolutely impeccable. 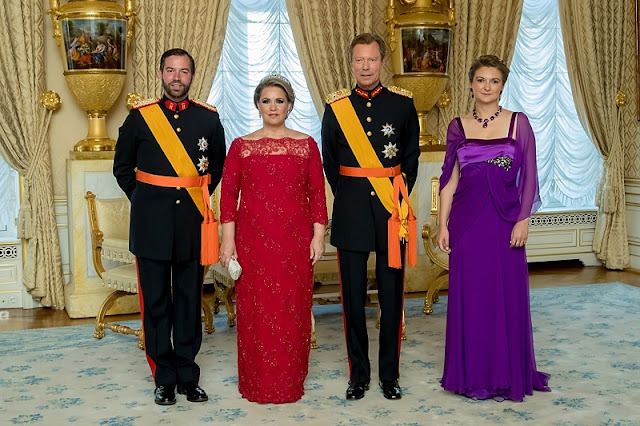 Maria Teresa must have known she was looking good, because she turned up to the evening's gala wearing what is basically just the gown version of her day outfit. If it ain't broke, don't fix it, right? ...there it is. 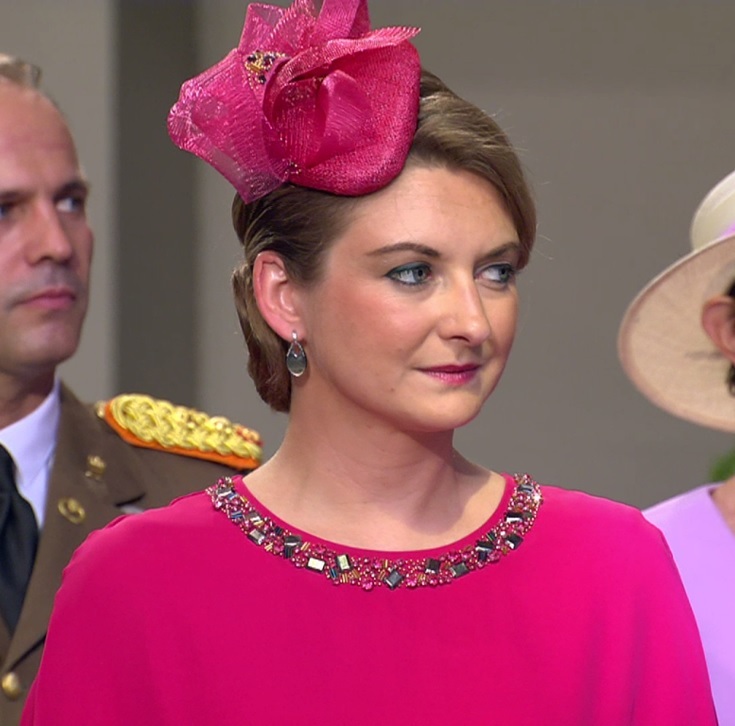 Stéphanie's mother-in-law wore the dress in 2008 during a state visit to Sweden (a dress memorable to me because Maria Teresa apparently removed her tiara after seeing the Swedish royal family roll up without their diadems, awkward). 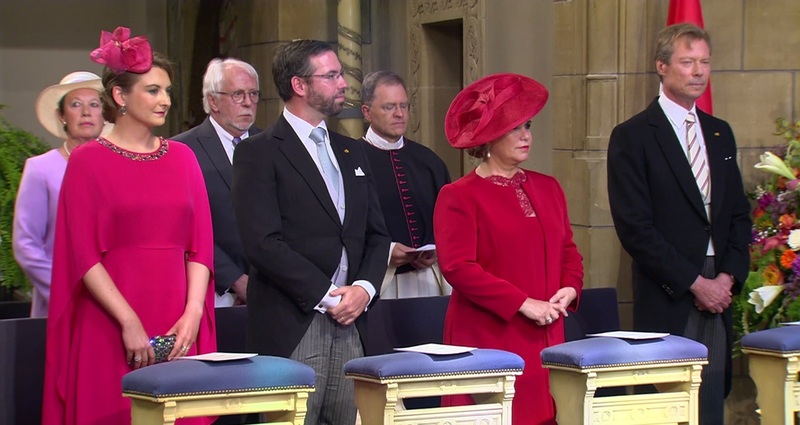 The grand ducal family has one large, magical one-size-fits-all closet from which they all shop, or so it seems. Luxarazzi has an entire series of posts covering their clothes swapping twin moments. First they test my love for capes, now they're testing my love of purple and amethysts. Hmmmmmm. For full National Day coverage (and more fashion IDs), Luxarazzi has you covered as always.